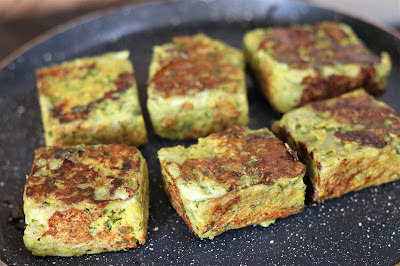 Check out how to make Mahajrastrian Kothimbir Vadi Recipe. Kothimbir vadi is a popular deep fried snack from the Maharashtrian cuisine loaded with flavour of fresh coriander leaves. 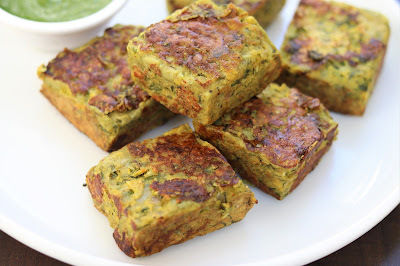 We have made healthier non - fried snack, Kothimbir Wadi recipe. 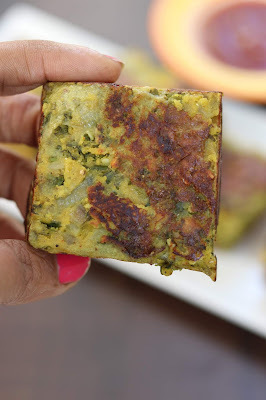 कोथिंबीर वडी or Kothimbir vadi is Maharastrian tea time compliment for that small craving in between meals. Must try out this healthy tea time Indian snack recipe. 1. In a bowl mix all the ingredients and prepare a batter using water. The batter should be thick. 2. Transfer the batter in a greased dish and steam it for 10 -15 min till batter is cooker properly. 3. Once cooked, cool it down and cut into desired square pcs. 4. Prepare the marinade and spread on all steamed vadi. This is an optional step. One can skip marinade and directly pan fry it. 5. Keep in marinade mixture for 10 min. Then pan fry all vadi pcs till cooked from all the sides. 6. Serve hot with chutney or sauce.